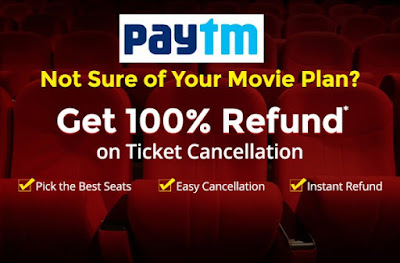 Paytm Movie Ticket Cancellation Offer, Get 100% Refund on Movie Ticket Cancellation. Promo codes can be selected according to different movies and cities. Cancellation Protect feature is available only on selected cinemas and a limited number of seats. You will receive your seat details and movie booking id 3 hours prior to the show time. Cancellation will only be considered if the request is made 3 hours before the show. No cancellation request will be accepted after receiving the movie booking ID and seat details. upon cancel the ticket 3 hours before the show, you will be refunded the full ticket price in your Paytm wallet within 24 hours of cancellation. The cancellation protection is a promotional offer by paytm and it reserves the right to change the conditions or discontinue the offer at any time without prior notice. Paytm Movie Offer on Suresh Production Cinemas, Use Promo Code- SP200 To Get Rs 200 Cashback. Paytm Movie Offer on ICICI Net Banking, Use Promo Code- 'ICICINB'.